Let's face it... if you are like most people, you work all day, come home exhausted, and don't have time to sleep more than 6 hours before having to do it all again. Not only do you NOT have time to come home and prepare that lavish six course meal you've been dreaming about, but you're just lucky to have time to eat anything at all. I am no exception to this rule. Last night I came home hungry, tired, and ready to take a nap. Luckily, my wife came to the rescue. While hardly a six course white glove meal, my daily suffering rendered me ecstatic to enjoy her homemade Pork Chops a la Shake 'n Bake. It was just what the doctor ordered! I can't describe how much time I spend deciding which bottle of wine to enjoy with dinner. Is anyone else guilty of this? It probably took me longer to figure out what to crack open than it did for my wife to prepare the entire meal and have it waiting on the table. Like any good wino, I asked my twitter friends what type of wine they would recommend. This is one of my favorite things to do because I am sure to get back over a million different answers... many of which I never would have dreamed of pairing. This particular instance proved to be no exception. Everything from Pinot Noir to Sauvignon Blanc to even Dolcetto came popping up in my tweetdeck window. I was seduced by this wine's perfume as it came wafting from my glass. Deep in color, and full in the mouth, this wine had the body to stand up to my crusted pork chops. Although it needed to settle down when it was first opened, patience and air tamed the levels of acidity and alcohol significantly. I was intrigued to taste this California reincarnation of the third most popular grape variety in Italy. Although I have not had many others of its kind to compare it to, I found this Piedmont grape to be a fruity yet structured counterpart to the common California Pinot Noir. For the price, I think I would have had much more trouble finding a Pinot that would have tasted as balanced and enjoyable. In my opinion and based on my palate, it would cost at least $30 to find a Pinot that compares. Click here for additional wine info and scores as I reveal my affairs with the grape. i really think Jacuzzi wines are not all that good.. just my 2 cents. great looking place yet sub par wines.. I haven't had many other Barberas compare with this bottle from Jacuzzi but like I said, it wasn't bad especially considering the price. Now, when you tasted wines from Jacuzzi, did you try this particular one? Did anything happen that turned you off. I actually really like comments that don't just stroke the winery but actually share a differing point of view. 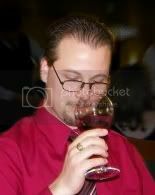 After all, best way for people to learn what it is that they enjoy in a glass of wine is to learn what they DON'T enjoy. 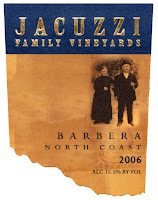 I think you are correct... Cline Vineyards is part of the Jacuzzi family! What did you think of their wine? Are other Barberas out there much better... and possibly even cheaper? I have not had any Jacuzzi wines yet, though am always intrigued by California wineries using Italian grapes. I do like some Cline wines though, so may check for this Jacuzzi Barbera to see what I think about it. Thanks. I really want to learn more about Italian grapes that are produced either in their native country or even in the US. This was the first of hopefully many new experiences... I look forward to hearing your thoughts on this one. Without a frame of reference, it's hard to compare but obviously I know the characteristics that I enjoy and that make up a good bottle of wine. For example, I enjoyed the finish on this wine. It wasn't flimsy like many others that sell for this price. The biggest flaw that I found was that it was a little harsh right out of the bottle. This calmed down a bit with some air but still lingered. Thank you! :) I'll look forward to hearing your thoughts on this one. I really appreciate the positive words... comments like this make all of the hard work and time worthwhile!